Long before the information age brought entertainment on demand, people found their amusement at neighbors’ homes. Guests took part in dramatic readings of prose and poetry, and sang together accompanied by small parlor instruments. The Newburgh Historical Society is recreating this scene by hosting a parlor event at the Crawford House. The Music for Mother's Day concert will feature a selection of nineteenth century music performed lived by Christopher Brellochs, Cynthia Peterson, and Elizabeth Gerbi. The trio specializes in music of nineteenth century America, developing programs that capture the unique history of each mansion where they perform, including the finest music from Paris, London, and America by composers like Gilbert & Sullivan, Jerome Kern, and Newburgh’s original Ulysses Alsdorf. The event offers the opportunity to see a rare and beautiful antique pianoforte made in Newburgh by the Carman & Fancher company about 1860. The piano manufactory was once located on the corner of Broadway and South Colden Street. A brief history of the old piano and its origins will be given. 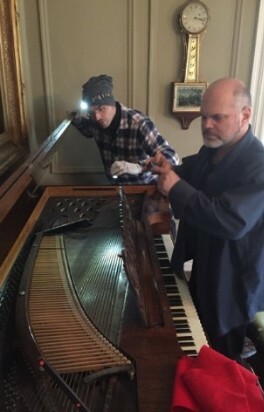 Admission for the concert will go toward the repair and tuning of the antique instrument. Please use the form below to make a reservation. Space is limited. Directions and additional information will be distributed by email. If your prefer to reach someone by phone, please call (845) 561-2585. *Reservations are closed. Thank you to all who participated. In Washington's Shadow by Tashae Smith. The musical trio will play music by a variety of composers including Newburgh’s original Ulysses Alsdorf. The Alsdorf family has a remarkable history including ties to the Underground Railroad in the Hudson Valley. Listen to their story as told by Smith.